The second-generation Starling 2 is one of the most anticipated additions to Spydercos economical byrd line of knives. 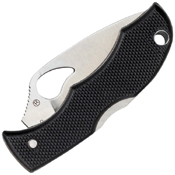 Specifically designed as a carry-anywhere pocketknife, it offers serious cutting performance in an extremely compact 1.1-ounce package. The business end of the Starling 2 is a full-flat-ground PlainEdge blade crafted from CTS BD1 stainless steel. Unlike the often troublesome nail nick of traditional pocketknives, its signature comet-shaped hole allows fingernail-free two-handed opening and proudly proclaims the knifes membership in the byrd family.The Starling 2s handle is constructed with full stainless steel liners covered with textured G-10 scales that ensure a secure, non-slip grip. A sturdy back lock mechanism locks the blade firmly in the open position and a lanyard hole in the handle allows easy attachment of lanyards and even key chains. 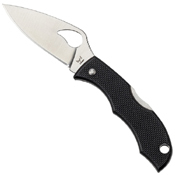 A true pocketknife, the Starling 2 does not include a clip.